Nigel Farage expects a ‘record turnout’, but what’s the figure to beat? Speaking on Radio 4’s Today programme this morning, Nigel Farage forecast a “record turnout” in the European elections. It’s rare to hear a politician talking up the likelihood of a bumper poll, particularly outside of a general election. But it is somewhat in keeping with Farage’s fondness for heightening expectations instead of the more conventional approach of dampening them down. The one to beat is 2004: 38.5%. My instinct is that won’t happen, though the final figure will probably be – as is so often the case – in the mid-30s. 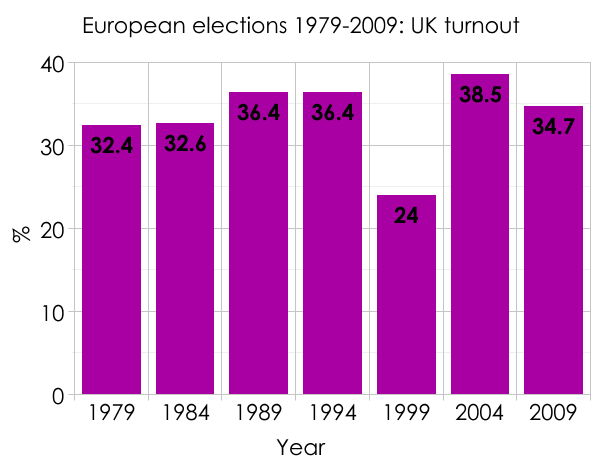 It’s curious that, for all the waxing and waning of the EU’s popularity through the years, turnout in elections hasn’t been that inconsistent. The one exception is 1999, which the then-Tory leader William Hague tried to frame as a “battle against the euro”. The Tories topped that particular poll, though it did them not a jot of good come the general election two years later.